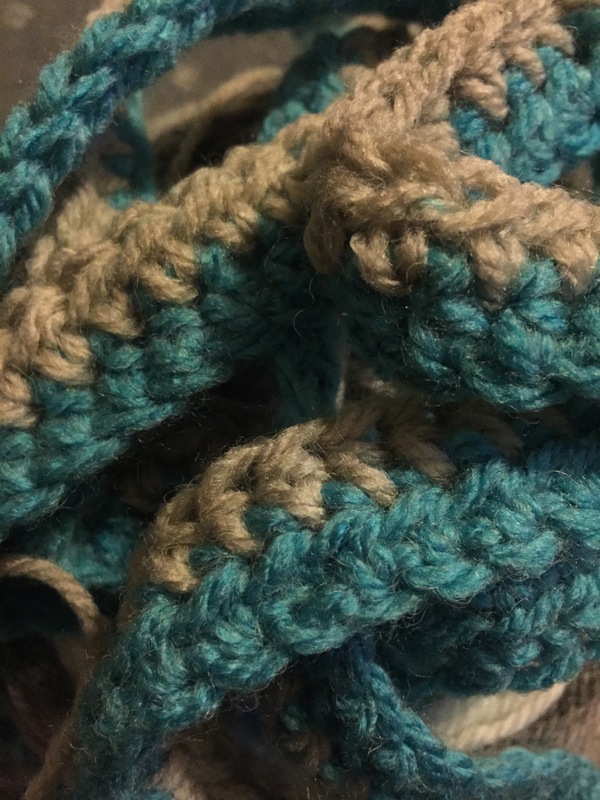 Last week, I began my summer craft challenge for this year. Beginning on the first day of July seemed as good a time as any! 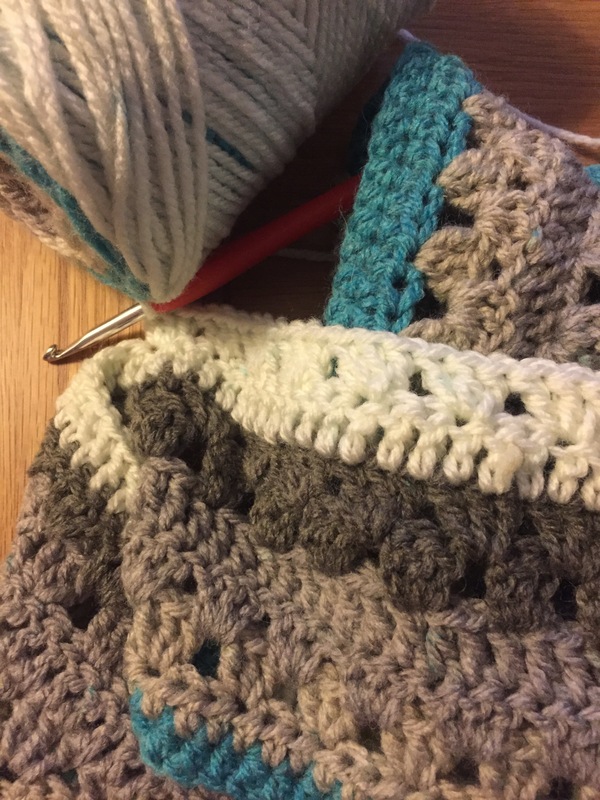 So this is the second installment of my weekly craft challenge round up. It began in Gibraltar and ended in Manchester as the Little Postcards and I started our summer holidays. 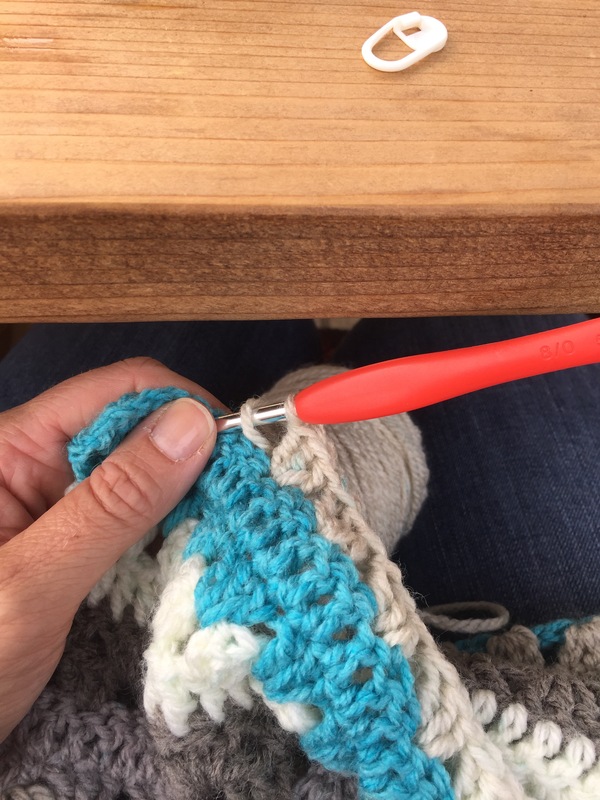 Our last chance to take a dip in the pool and my last chance for some Mediterranean alfresco crochet for a while. 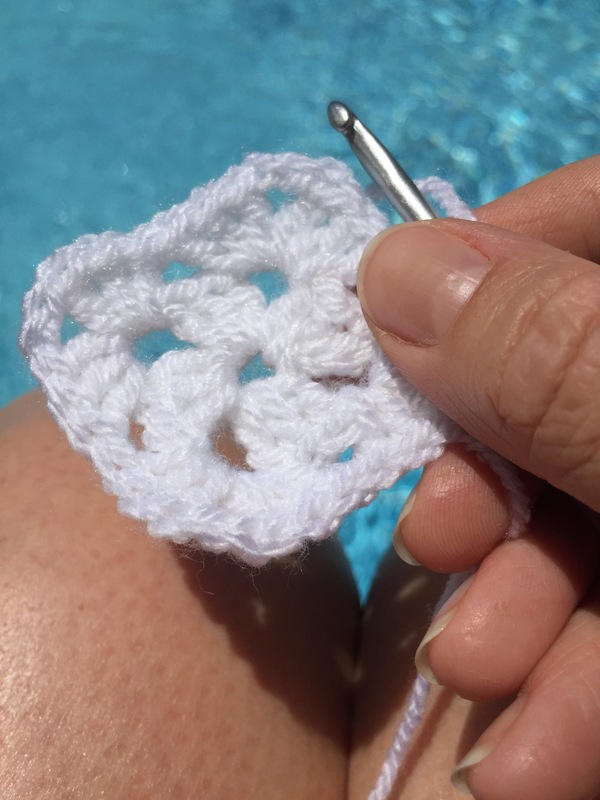 A simple granny square by the pool was as exciting as it got. On Sunday, we flew from Gibraltar to Manchester to visit my family. I was rather tired by the end of the day after wrangling three Little Postcards through the airport without Mr Postcard (we left him at home). I managed to begin a project using my new Caron Cake, but just a few rows as I was a bit jaded! Monday saw a bit more progress on my Caron Cake project, although not a lot! By Tuesday I was getting into the swing of it and really loving the colour changes in the yarn. 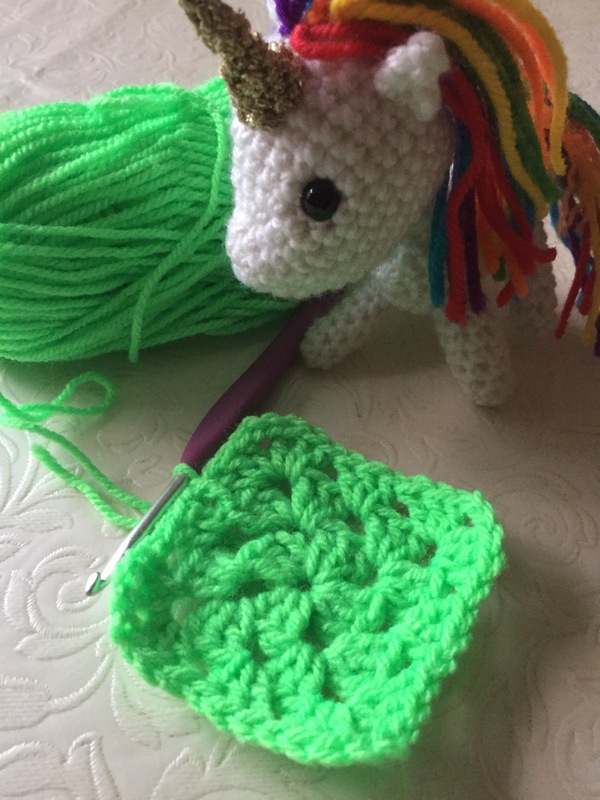 On Wednesday it was rather busy, so I didn’t have much time for crochet, just a lonely little granny square to add to a long standing WIP back at home. 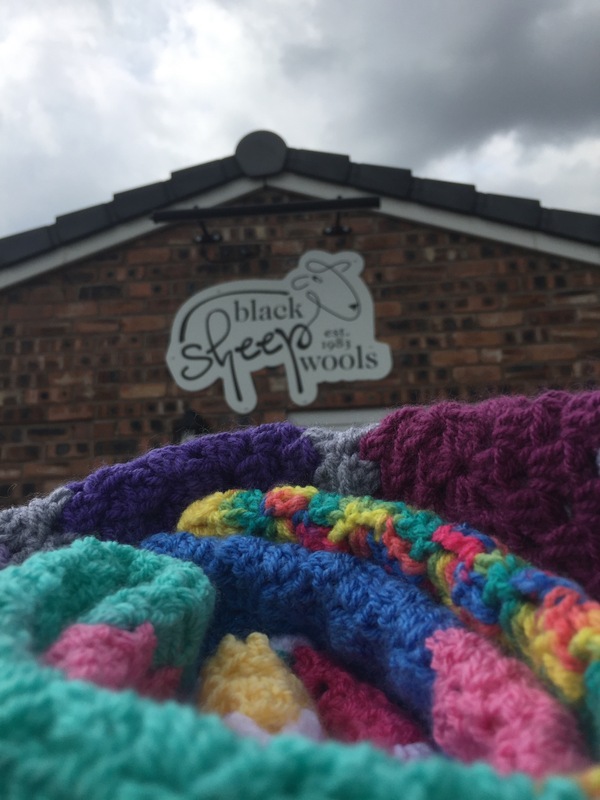 After a bit of a slow start to my week, craft wise Thursday was brim full of yarny goodness… First stop Black Sheep Wools in Culcheth, near Warrington to drop off three Sixty Million Trebles blankets which had been made in Gibraltar. One was made as a collaboration through the Gibraltar Crochet Collective, the other two by me. They will now be parceled up and sent off to child refugees. Oh how I do like Black Sheep Wools… So many lovely balls of wool to squidge and gorgeous colours to feast your eyes upon. Europa felt rather at home there 😉. Next stop, a nearby pub for a spot of lunch. Then, while the Little Postcards played nearby, I managed to get a bit of surreptitious under the picnic table hooky done! Back at my parents’ home I finished it… I played yarn chicken (going in for another row) and won! 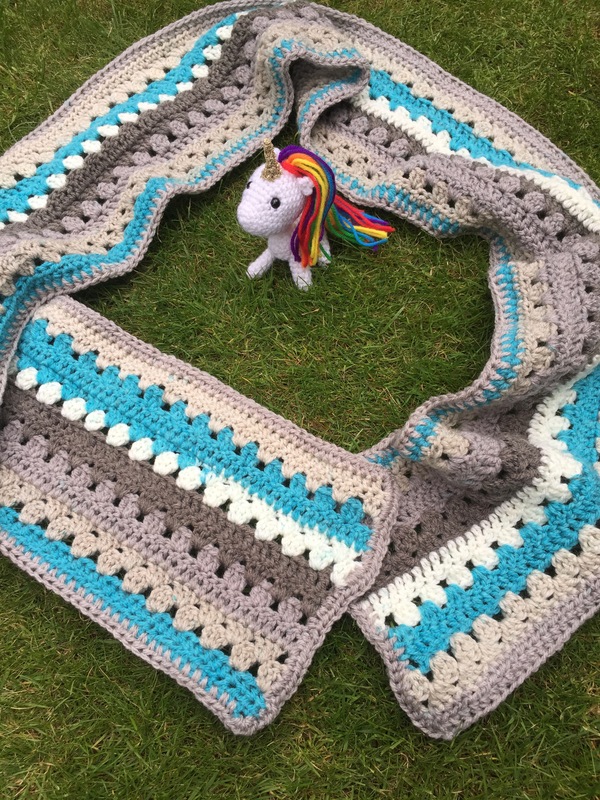 The finished article… Perfect for snuggling up in winter. Time for another new project using birthday present wool (the Caron Cake used for my scarf this week was also a birthday gift). 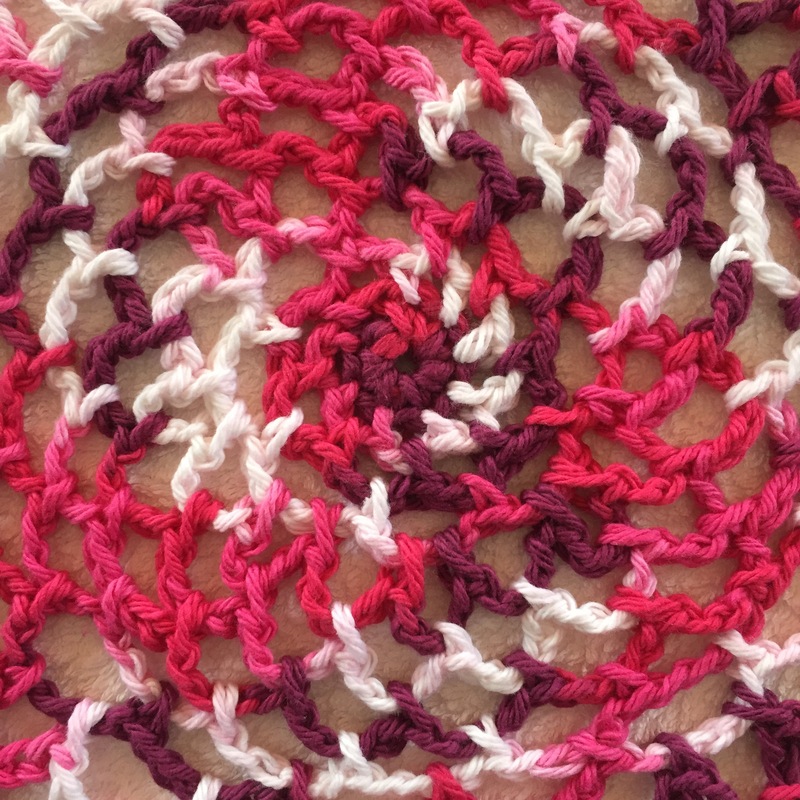 I got into a raspberry swirl with this lovely yarn as I began a string bag pattern. So, there you have it, my second weekly round up. If you feel inspired, why not join in too, just tag your Instagram photos with #summercraftchallenge2017. Such a lovely blog post. 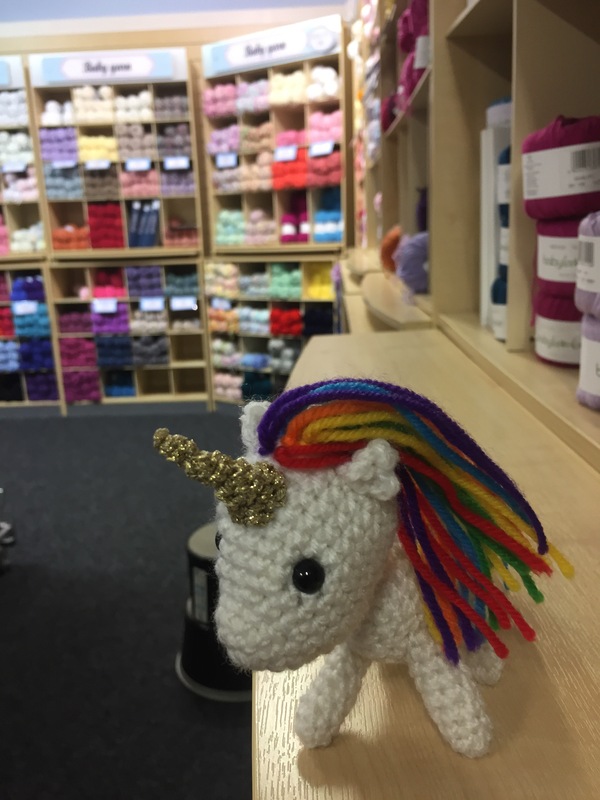 Nice to see Europa enjoying the wool shop I’ve actually bought from m them this week for the first time.Wish we had a bigger selection of wool here in Gibraltar. Lovely to see you progress – and great to see you managed something every day despite the having little travelling postcards to take care of. Ah thanks Bekki, yes, that first evening in England was a struggle to find the oomph to get going! 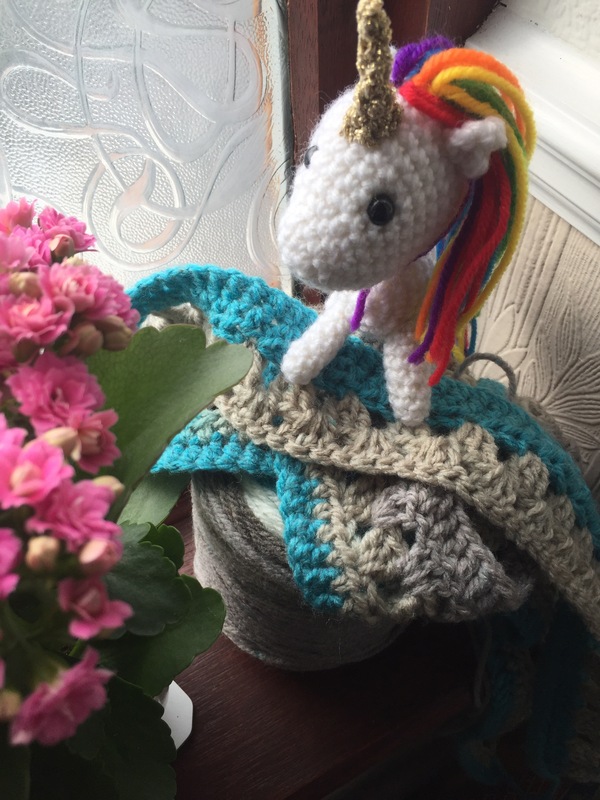 Thanks Sheila, my family thinks I’m mad carting a crocheted unicorn about and posing her for photos… my Mum overheard some ladies in the wool shop talking about a unicorn and assumed I must have brought her out of my bag (I thought I’d got away with my surreptitious photo shoot unseen 🙈) nevermind! 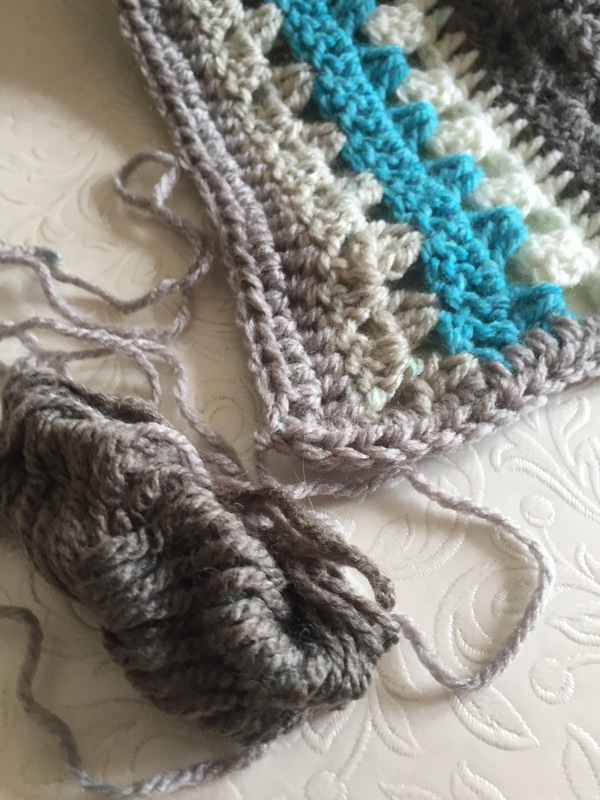 Yes, the Caron Cake was self striping, I know what you mean about colours – I’m not sure if I would have bought it myself, but I like it very much now it’s worked up so well.